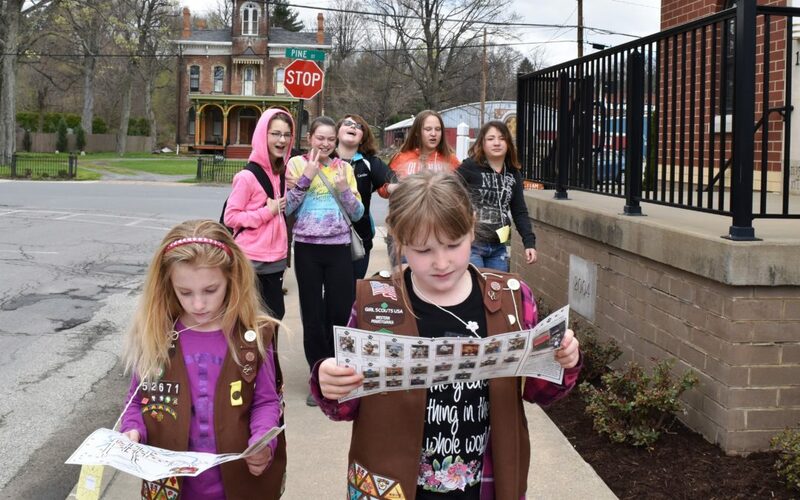 April is a big month for Girl Scouts at the Weather Discovery Center. We kick our programming off on Saturday, April 13 with the Daisy Flower Garden Journey Day. On that day, from 9 a.m. through noon, Girl Scout Daisies can complete the three parts of the Daisy Flower Garden Journey: Watering Can Award, Golden Honey Bee Award, and Amazing Daisy Award. Through activities, crafts, games and interactive learning, the girls will work through the requirements for each award. When they are finished, the Scouts will conclude with the closing Garden Party, which will include a snack and refreshments. Throughout the session, breaks will be given so the participants can get moving with free time on our exhibits. The cost for the Daisy Flower Garden Journey Day is $15 per person. Pre-register by April 8 to 814-938-1000 or info@weatherdiscovery.org. On the heels of Flower Garden Journey Day is Punxsutawney Phil’s Weather Extravaganza for Girl Scouts. Being held on Saturday, April 27 from 10 a.m. – 2 p.m., the Extravaganza is a day full of fun and learning for Girl Scouts at all levels. Throughout the day, the Scouts will visit the Weather Discovery Center and make a SWAP (Special Whatchamacallits Affectionately Pinned Somewhere), take a walking tour of some of the Phantastic Phils Public Art, have lunch and a program with Punxsutawney Phil at Gobblers Knob, and take a stroll on the Gobblers Knob walking trail to learn about the tradition of Groundhog Day. Scouts will begin their day at one of two locations–either at the Weather Discovery Center or at Gobblers Knob. (Scouts will be notified of their starting point before April 27.) All Scouts will be together at lunch, then will exchange places for the afternoon sessions. Registration for Punxsutawney Phil’s Weather Extravaganza is by April 12 on the Girl Scouts of Western PA web site – https://www.gswpa.org. Finally, the first Saturday in May is Girl Scout Juniors Get Moving Journey Day. From 9 a.m. – 1 p.m. on Saturday, May 4, Juniors can complete all three parts of the Get Moving Journey: Energize, Investigate, and Innovate. Program includes a snack and free time on the exhibits. The cost is $20 per Scout. Pre-register by April 29 to 814-938-1000 or info@weatherdiscovery.org.